Devart has upgraded their enterprise grade universal data access component suite for Delphi XE8 Firemonkey. This is an amazing data access component suite which provides direct database access from Android, IOS, Windows, and Mac for a variety of databases. It is possible to connect to Oracle, SQL Server, MySQL, PostgreSQL, and SQLite without using a client library with these components. Other databases like Firebird, Interbase, NexusDB, MS Access, and even ODBC connectivity are also supported. Additional functionality includes things like database-independent data storage with TVirtualTable component, automatic data updating with TUniQuery, TUniTable, and TUniStoredProc components, advanced script execution features with the TUniScript component, and even server-independent SQL through a powerful macro engine. You really have to check out the full feature list to appreciate all of the functionality that this data access component suite provides. This is a commercial component suite and a free trial is also available. The components should work with Appmethod as well. 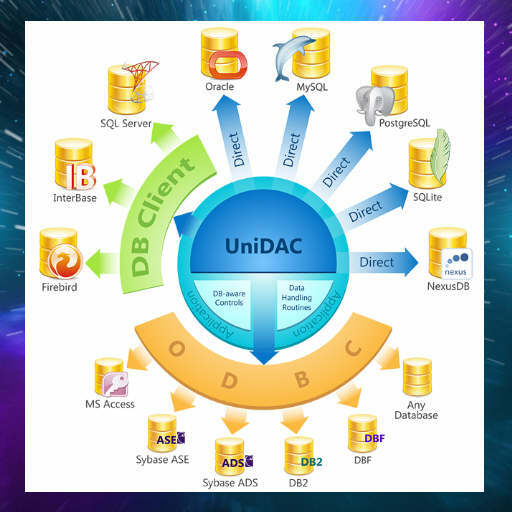 Head over and check out all of the functionality of UniDAC for Delphi XE8 Firemonkey and then download the free trial.